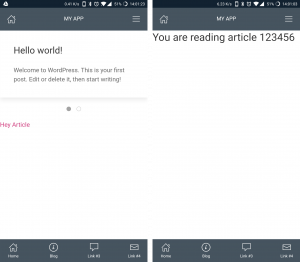 In this tutorial we are going to create a blog section within our app that will allow us to view a full article as well as individual “cards” that will give us a thumbnail view. This structure can be easily ported for news articles and similar media. The first thing we are going to do is create two App Pages, one to list all of our posts called “Blog” and another for the article content which we will call “Article”. Let’s make “Blog” a child of our homepage so that the page transitions are consistent when navigating back and forth and set the “Article” page as a child of “Blog”. Awesome! 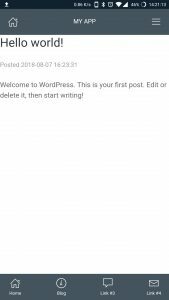 Now we are going to pull in all of our published WordPress posts rather than creating a new post type. In order to do this we will need to create a new function, making use of the get_page_response in MyAppuccino for WordPress plugin. Now that we added the code to our functions file we should have our blog posts coming through the data object under “blog_posts”. You can take a look at your posts object by clicking “posts.json” in the MyAppuccino tab within the WordPress admin sidebar. Notice that we’re using the post items ID as the key here. This will become useful later on. As this information is now being pulled into our app, we can start by creating a view to pull in a summary of posts which we will display as cards in our app. 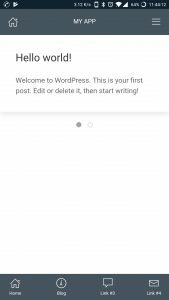 Within our MyAppuccino plugin we are going to create a new template called “blog_posts.php” which will loop through and display our posts. We are going to use UIKit’s content slider that contains cards. As you can see in our template on line 12 we loop through the data object’s blog_posts and then set the header and footer on lines 16-18. Now it’s time to open up our “Blog” App Page and change our template to the newly created “blog_posts.php”. Now let’s fire up our app and take a look! As we can see our cards are loading in nicely. We can modify how it sits and add images etc. later on but currently we want to add the template for our article page that will allow us to view the post we’ve selected from the card view. Once again we are going to create another template but before we do that we will need to edit our article App Page to include some custom parameters. We are going to modify the App Pages’ URI to accept our post ID variable, to do this we simply need to add a custom field in our Article page called “parameters” and pass the variable name as the value. You can read more about custom attributes in the MyAppuccino for WordPress documentation. Now that we’ve created the variable :pid it will be available in our app’s route parameters as simply “pid”. We will need to add a scoped variable to access the parameters. See line 18 where we declare params into our scope. We can now access this object in our template and throughout our app in the format #/home/blog/article/:pid. Lets go back a few steps and continue creating a new template for our blog article, we will simply call it “blog_article.php” and set it as the template for our article page. You will notice that we’re simply binding the pid to a heading here, this is just to test that it’s coming through as expected. We can now create a link in our blog page to test this out so I’ve created a dummy link #/home/blog/article/123456 which will load up the article template and pass the variable “pid” to our “params” object. Once again, lets fire up our app and we can see that our dummy link “Hey Article” points us to the article page which injects the parameter into the template. Now that we have our URI parameters working as expected lets go back and update our “blog_posts.php” template so that each card item links to the article page. Remember when we used the post ID as the index? Well, this is where the magic happens! All that we have changed in the template is added a link on line 19 to take the current post ID and pass it to our article page. We can now edit our “blog_article.php” template and using the post ID (which is also the items index in the data object) passed in the route, we can pull through the content. We are using the parameter passed in the URI as the index for the blog posts object. The reason we used the post ID and simply not a standard index is because if a new blog post is created as a user clicks a card then the index may change and cause unwanted content shifting when viewing articles. For the final time, lets load up our app and take a look at our article. Awesome! It needs a little bit of styling TLC but we’re successfully pulling through content. You can go back and include whatever you want into the blog posts object. A few ideas may be a “one hour ago” style time stamp, author name and photo and “similar articles” links – go nuts!